Over here we like to think we’re all works of art with our unique coils and kinks bouncing off our heads and rarely need anyone else to validate our inarguable fabulousness, right? Right! Yet as funky and fierce as us curly girls can naturally be, some of us still feel like it’s nice to receive a bit of the princess treatment every once in a while, don’t we? Long, bone-straight hair is lovely too, no doubt, but sometimes we’ve all just seen enough of the typical starlet look to really be moved by it. That's why this princess holds a special in the hearts of our curly community. As part of Disney’s “Where Your Destiny Awaits” themed photos, loyal fans of Disney’s wildly-curly Pixar character will get a chance to see a real-life version of the boisterous girl from the acclaimed animated film Brave. Bold and gutsy curlies of all hair types can all come together to celebrate another fearless girl with hair that really makes waves thanks to famed portrait photographer Annie Leibovitz. 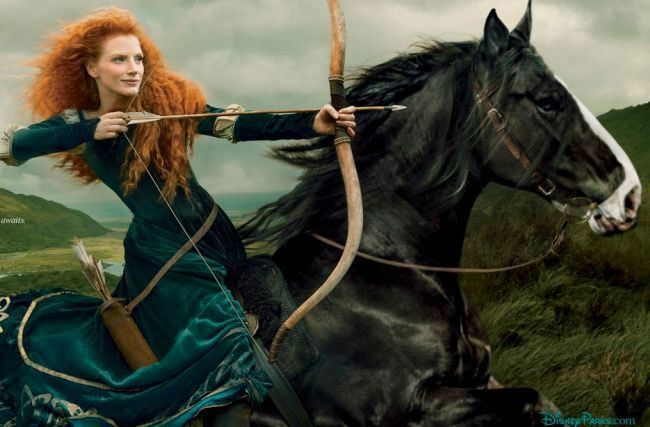 Leibovitz is known best for her poignant knack for capturing stunning celebrity photos and she does it once again with her ethereal portrayal of fiery-maned actress Jessica Chastain as Merida for Disney’s advertising campaign. The Oscar-nominated actress dons a majestic dress and wields a powerful bow and arrow as her luscious, red locks assist her in effortlessly channeling the Scottish Princess that won over everyone’s heart back in 2012. 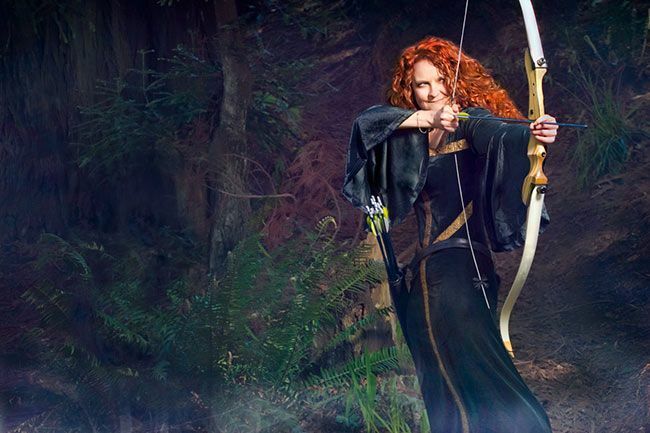 Jessica embodies Merida’s strength and courage with her nearly-identical unruly cascade of crimson curls as she sits mounted on a regal steed. As the latest Hollywood it-girl to be honored by receiving the Disney princess treatment, she joins the ranks of established stars and common favorites including Queen Latifah who was photographed as Ursula from The Little Mermaid, Scarlett Johansson as Cinderella and Beyonce as Alice from Alice in Wonderland.